When Is It Time to Look into a Home Stair Lift? It is time to look into a home stair lift for seniors with mobility issues. 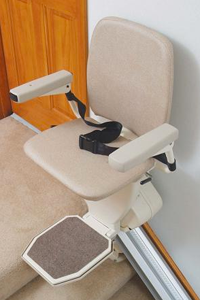 Stair lifts are a wonderful solution that will carry seniors up and down stairs in a safe, seated position. Seniors get easy access to the second story or basement level of their home. Stair lifts are ideal for seniors who live in older homes with steep stairs. They are also handy for seniors who walk with canes but may have trouble walking up and down stairs due to visual impairments, depth perception issues and general age-related losses. Seniors may be healthy and able to live alone without daily assistance, but navigating the stairs is a health risk not worth taking. If a transition to one floor living is not affordable or practical, a stair lift may be the best option for aging in place safely and efficiently. There are many stair lift options available to meet your needs and budget. For starters, you should know there are two basic kinds of stair lifts: straight or curved. A straight stair lift travels in a straight line up a flight of stairs uninterrupted by bends or curves. Curved stair lifts are ideal for older homes for stairs that travel around corners, bends and have changes in direction. Indy Stair Lifts, a division of Nationwide Lifts, the national leader in home elevators and lifts, offers stair lifts for all types of staircases. Choose from lifts in compact, extra-large, outdoor or wheelchair-accessible lift designs that will fit perfectly in your home. If your home has a narrow set of stairs, go with one of our compact stair lifts. If you need accessibility for your porch or front steps, choose the Indy Outdoor stair lift. If you have an angled or winding staircase, the Indy Curve can be custom designed to match the specifications of your stairway. Each stair lift installs inches from the wall and folds up easily at either end to keep the stairway free for general use. Call 888 203-5754 for information about Indy Stair Lifts and visit one of our convenient offices located around the country. When it’s time to look into a home stair lift, Indy Stair Lifts is your best bet for a comfortable and convenient stair lift that will enhance your mobility and allow you to remain in your home.